Blogging is absolutely essential to your inbound marketing efforts. Keeping your blog article titles short and concise is just as important. It helps your readers know what they will find in the article, helps your SEO when it comes to your blog, and definitely helps your click through rate. Alright Alright Alright! Welcome to this week's episode of Friday Fails! This week we are going to talk about really ridiculously long, awkward blog titles. Google is going to cut off your blog title after a certain amount of characters and add an ellipsis. This is really going to decrease your click through rate. Your visitors aren't going to be able to read your entire blog title, not know what the article is really all about, so of course not many people are going to click on it. Also, if any keywords are added to the end of your blog title and got cut off, you've lost an opportunity that could help your SEO. Our first example is from Mike, our very own here at LyntonWeb. He also edits these videos so it's a good chance he might kill me. 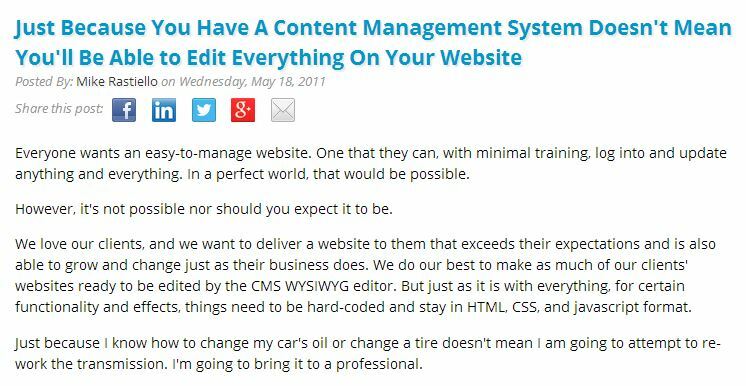 But Mike in 2011, wrote a blog titled "Just Because You Have a Content Management System Doesn't Mean You'll Be Able to Edit Everything On Your Website." 112 characters Mike! 112! Secondly, from the Fast Company, we have a blog titled "NSA and British Intelligence Impersonating Facebook, Hijacking Adbots to Infect Millions of Computers with Malware." Very fancy, I don't know what half of that means, but there's 115 characters and there's a good chance a lot of the people on Google searching for this didn't read it, because they couldn't read half of the blog title. FAIL! Another example is maybe you have a great blog article and it's titled "1 Million Ways to Maybe Potentially Someday Consider Think About Killing Your Old Ma..." Killing your old what!? Your mother? Now your mother's not talking to you, your friends are really creeped out, and no one knows that your blog title was supposed to talk about "1 Million Ways to Maybe Someday Possibly Potentially Kill Your Old Marketing Program." So that's how you fix this week's episode of Friday Fails, and be sure to tune in next week! 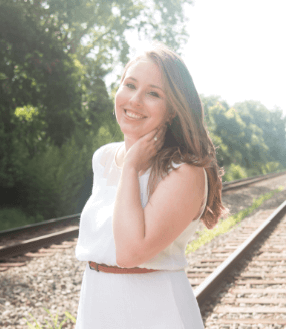 As Marketing Manager for LyntonWeb, Jennifer enjoys utilizing HubSpot's Social Inbox, using her slightly OCD tendencies for client's organizational benefit, and blogging in a sarcastic tone. She's also the leader of the official Houston HubSpot User Group. Jennifer is a proud Houston, Texas native, where she graduated from the University of Houston with a BBA in Marketing. When she's not brushing up on her inbound marketing skills, Jennifer is a Houston Texans fanatic by day and a musical theater nerd by night.